Congratulation to Penelope Merriweather, winner of the “Like Parker Francis” contest. As I said in my last post, the contest generated over 350 new Likes to the official Parker Francis Facebook page, spurred, perhaps, by the prize of an autographed copy of BRING DOWN THE FURIES. Penelope’s number was chosen using Random.org which generates what it terms “true random numbers” and is operated by the School of Computer Science and Statistics at Trinity College in Dublin, Ireland. Many thanks to everyone who took the time to Like the page. Check back later for another contest, as soon as my brain spins out another randomly generated idea. On December 20 I kicked off a new contest I called the Drive to 205, a blatant attempt to add more Likes to my Parker Francis Facebook page. At the time I had only 95 Likes and was feeling despondent. I said I hoped to double the current number to 205 in the next few weeks, but I was giving myself to the end of January to top the 200 mark. As an incentive I would hold a drawing for an autographed copy of BRING DOWN THE FURIES. Who would have guessed so many people liked Parker Francis. By the end of January the number had far surpassed the 205 mark and settled in close to the 475 mark. I’ve been busy capturing the names of all the people who Liked the page and assigned each a number based on the chronological order they clicked the Like button. The next step will be to feed the total number into Random.org’s number generator and come out with a winning number. Stay tuned. You might be the winner. I’m calling my newest contest the “Drive to 205.” Currently, there are 95 “likes” on my Parker Francis Facebook page. Not a bad start, but in an effort to double that number in the next few weeks, I’m offering everyone the opportunity to win an autographed copy of BRING DOWN THE FURIES simply by Liking the Facebook page. When you Like it I receive a notice from Facebook and I’ll enter your name chronologically in the contest. After the number reaches 205, I’ll use Random.org to generate the winning number. You might be the winner, but don’t keep it to yourself. Tell your FB Friends and tweet your followers and help Parker Francis in his modest goal to reach 205. The first Quint Mitchell book give-away is over. Congratulations to Anna Rabhan and Randy Austin, winners of a Kindle copy of Bring Down the Furies. They won it after purchasing a copy of Blue Crabs at Midnight and entering the contest by forwarding a copy of their receipt. 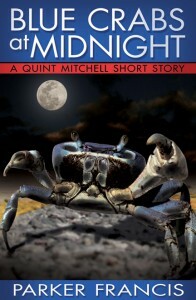 Blue Crabs at Midnight provides a different take on our hard-bitten protagonist Quint Mitchell since he’s only 13-years old in the story. But he still manages to find trouble. 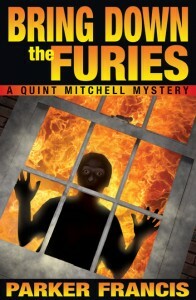 I hope the story whet’s your appetite for Bring Down the Furies. That book is available in both digital and print formats.